NEW YORK, June 23, 2016 – LG Electronics’ SIGNATURE 4K OLED TV was crowned “2016 King of TV” in the 13th Annual Value Electronics TV Shootout™ in a competition among four contending flagship 4K Ultra HD TV models from LG and other leading brands during CE Week in New York City. The 65-inch class (64.5 inches measured diagonally) LG SIGNATURE OLED TV (model OLED65G6P) with HDR was voted the top-performing TV by both general attendees and an expert panel of professional calibrators based on eight different picture quality attributes. The Value Electronics TV Shootout is an annual event comparing the flagship TVs from leading manufacturers to identify which provides the best picture quality. Each TV in the 2016 competition was calibrated independently by the TV Shootout organizers and evaluated by CE Week attendees, including industry experts, tech influencers and A/V enthusiasts. Voters assessed a number of key performance qualities including black level, perceived contrast, color accuracy, and motion resolution, among others. The breathtaking picture quality of the LG SIGNATURE OLED TV beat out leading competitors to earn the industry’s “King of TV” designation for 2016. The LG SIGNATURE OLED TV – along with LG’s full line of 2016 4K OLED Smart TVs with HDR totaling eight models – delivers the stunning picture quality and advanced technologies of OLED: perfect blacks, improved brightness, expanded color, and amazing pictures even at wide viewing angles. Thanks to OLED’s unique ability to turn each pixel on or completely off, LG OLED TVs produce perfect blacks and flawlessly render crisp, vibrant colors and rich shadow details, even when bright objects are directly next to deep, dark areas (unlike LCD TVs, which have a halo effect from light bleeding). Aesthetically, the LG SIGNATURE OLED TV’s “Picture-on-Glass” technology sets new benchmarks in design with an exceptionally thin depth (measuring about one-tenth of an inch) and a translucent glass back. The OLED module is applied directly to the glass back panel for a clean, ultra-slim profile and attaches to a powerful, forward-facing sound bar that doubles as a unique stand for a seemingly invisible bezel and stand. In addition to LG’s TV Shootout accolades for OLED TV at CE Week, the company’s premium series of 4K Ultra HD LED TVs – LG SUPER UHD TV – was named “2016 CE Week Best in Show.” Chosen by leading trade-press editors (judging usability, design, innovation, important features and overall user value), LG SUPER UHD TVs feature LG’s most advanced LED picture quality ever and can reproduce a wider color palette, and over a billion rich shades of color for a more lifelike picture. They are the first LED 4K UHD TVs to offer HDR with support for both Dolby Vision and HDR10. With support for both HDR formats, consumers have access to all the HDR content available today, and peace of mind that their TV will handle new content to come. Learn more about LG SUPER UHD TVs at www.lg.com/us/super-uhd-tvs. 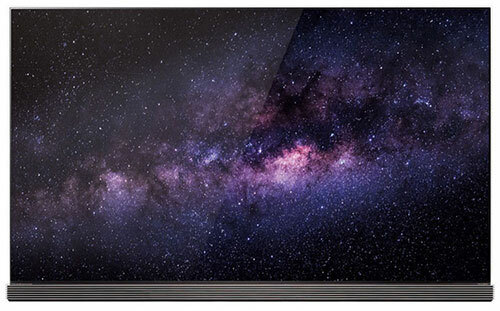 The LG SIGNATURE G6 OLED TV is available now at Value Electronics and various retailers nationwide at a suggested price of $7,999. The 2016 LG OLED TV line comprises four series (B6, C6, E6 and LG SIGNATURE OLED G6) with eight models ranging from 55-, 65- and 77-inches class sizes as well as curved and flat configurations. Learn more about LG OLED TV at www.lg.com/us/experience-tvs/oled-tv.